These demands were agreed at our first Member Forum which took place in Newham on July 4th 2018. They’ll continue to be discussed and developed by everyone in the union as we grow and learn. London Renters Union is member-led and member forums and meetings are key parts of the union’s democracy. 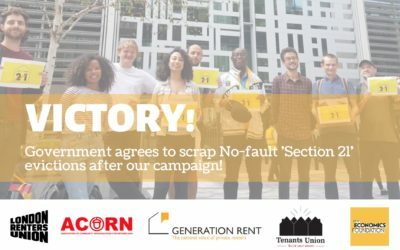 We’re a members-led, campaigning union and we’re taking action to make sure all Londoners have a decent, affordable and secure home. Join our community today and become part of the movement to transform the housing system. Sustained collective action pays off big time for Mary! 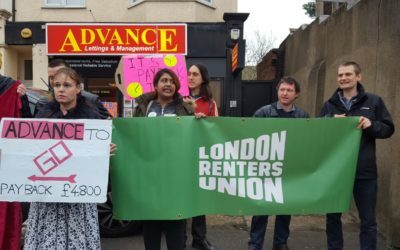 After a year of organising, Mary and the LRU have secured ALL of the money that Mary was owed, even when the law was on the side of the estate agents that had pressured her out of it. 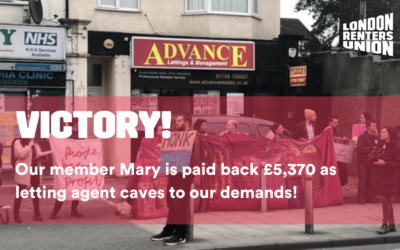 LRU members met with Advance Glenisters on Monday to negotiate repayment for fellow member Mary, as part of an ongoing campaign challenging the discrimination faced by recipients of housing benefits. Following the meeting, the union has agreed to pause the campaign against the company until the weekend, when Advance agreed to make a clear repayment offer for some of the debts Mary incurred to pay the costs they demanded of her last year. We are a non-profit co‑operative company limited by guarantee. Our company number is 11343619.